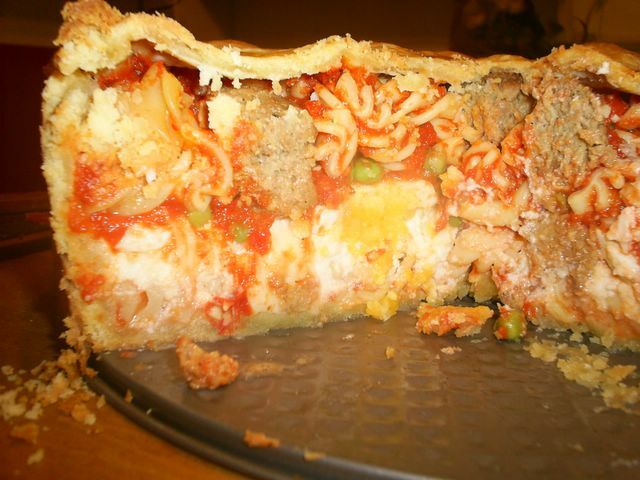 One of the strangest dishes I've ever made... Timpano a la Big Night, from Michael Chirarello. I happened to leave the TV on one evening, and found myself on the Fine Living Network. I don't really watch that channel...I mean, somewhere out there is a Law & Order (original, SVU or CI) rerun airing! Much more important. Anyway, Chirarello was making foods from film...spaghetti and meatballs from The Godfather, hot chocolate from (one of my favorites) Chocolat, and timpano, from Big Night. The timpano looked so very interesting, I just had to try it. But boy, I had no idea what I was getting myself into! Lots of steps in the recipe. Fortunately for me, I'd already made some tomato sauce, and we bought a bag of meatless meatballs. Still, it's a bit of work. 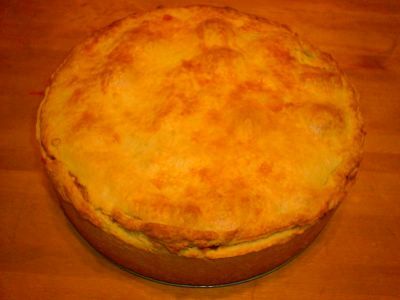 Make a pastry crust, which has to chill at least an hour. Boil pasta, toss with sauce. Put part of the crust into a springform pan, add pasta and grated Romano cheese. Then, meatballs, hard boiled eggs, mozzarella, and peas. Next, more sauce and Romano. Follow with pasta, sauce and cheese. Top with remaining crust, brush with egg, and bake. At least 45 minutes. And then when it comes out? It has to sit for another 30! Too bad I was starving...grrr. Granted, it was a weird combination of flavors, but we both really enjoyed it. Ok, maybe not the peas...the texture wasn't a favorite of ours. So, if you want to make something a little...different, and you have all freakin' day to do it, give the timpano a try! It looks fab, but I can understand the reluctance to go through all those steps again. And, I've never been entirely convinced of pasta baked in pastry - just seems a bit too much of a carbohydrate overload to be sensible! Oy; it was a pain to make. And yeah...heavy on the carbs. You definitely don't want to have more than a small piece...which is why Matt'll be eating the rest! I've always wanted to try one, but it just seemed sooo difficult! Now I see I'm right. And was it really worth it all? Worth it? Well...in being able to say I made one, sure. But eating-wise? No...not unless I was feeding six or seven more people. But just the two of us (Alex would never touch something like this!)? Work v. Results just not coming out equal. Amateur; you're right about that! It's fit into a 9 1/2" springform, and it actually comes up just a bit above the pan! And don't forget the cup of butter in the crust, the almost two pounds of ricotta, the pound of Romano, and I forget how much Mozzarella. Again, nice to try, and say 'look what I made! ', but I doubt I'll be doing it again.